JJ Abrams has been involved in some of the most popular television shows and movies of recent times. For example, LOST became a megahit for ABC. On the giant screen, Abrams was involved in Cloverfield,the movie that took Blair Witch one step further with its camcorder type feel. Abrams was also involved in the latest Star Trek film, you know, ther one where the real Spock Leonard Nimoy had a cameo at the end. Now Abrams in turning over the director's chair to you with his Action Movie FX app for iOS.The app is free and lets you insert some explosvie special effects into any video shot inside the app. There are two free selections, Missile Attack! and Car Smash. There are four more effects, Tornado and Chopper Down, Air Strike and Fire Fight which are available in units of two for 99 cents when purchased in-app. Other effects will soon be coming. So now you can make your own Michael Bay movie at home. 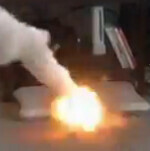 If i can blow up stuff like Michael Bay I would be a millionaire. No really check out how much money those explosions make. I downloaded this app this morning, it's funny as hell. Do we have something similar on android? That app looks good. JJ is "that dude". "Real Spock"...LOL, PhoneArena, you're funny. Maybe the term "original" is better? Quinto did one hell of a job, as did that whole cast. Shatner is my main man, so that's alot coming from me.